A WOUND IN TIME: WOW! Look What I Found! Clips From "A WOUND IN TIME"
WOW! Look What I Found! 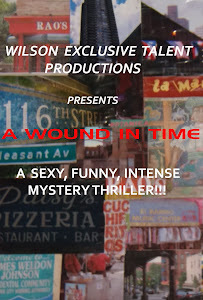 Clips From "A WOUND IN TIME"
I happen to stumble upon 2 video clips taken of the production of "A Wound In Time" last Fall at Nuyorican Poets Cafe. Just imagine this play filmed professionally with three broadcast quality cameras! One is the opening scene of salutations by Iya Carmen (played wonderfully by Soleidy Mendez) and the other is a scene just before Millie (played wonderfully by Ryss) and Iya Carmen begin a spiritual cleaning.